Multi franchise high-end car dealer Stratstone is to start selling restored classic Jaguars in partnership with Classic Motor Cars of Bridgnorth. Peter Neumark, Chairman of CMC, said: "We are delighted to have formed a relationship with Stratstone as it is the first time a classic restoration company like CMC has sold classic cars through a main dealer." believe that we are able to understand this specialist market. Throughout my time in the industry I have never come across a restorer as capable or passionate as CMC and it is a pleasure to work with them and their team." 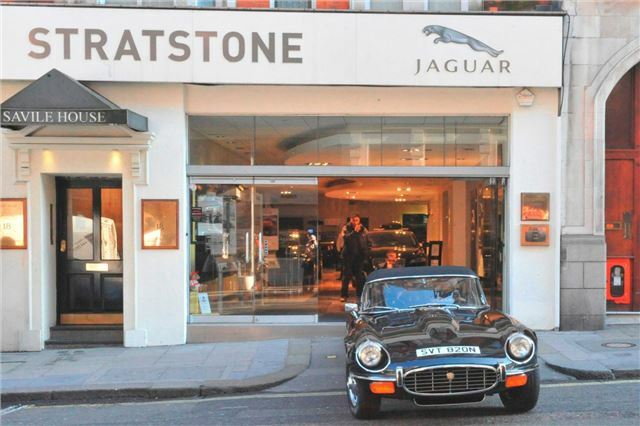 Stratstone of Mayfair is currently selling a Jaguar E-Type Series 3 V12, one of the last fifty E-Types which have come to be known as 'Commemorative'. As the production of Jaguar's most successful sportscar came to a close in 1974, the company marked the occasion by producing a special limited edition. The last fifty cars produced, with one exception (a green one), were painted Black with a Cinnamon interior and each one had affixed on its dashboard a brass plaque noting its unique production number and bearing the signature of Sir William Lyons, the company's founder. This particular E-Type, SVT 820N, was built on 15th May 1974 and dispatched to Byatts of Fenton Ltd, the Stoke-on-Trent dealership who sold it to one Mr. B.P Oakley. He owned the car for 27 years before it was sold at auction to its current owner. full mechanical overhaul and a bare metal respray. This car could have come off the production line yesterday, it is in magnificent condition." Peter Neumark added: "Being one of the last fifty E-Types ever built makes this car not only an important piece of Jaguar&rsquo;s history but will also probably prove to be a very wise investment. We hope that it helps to increase foot fall at Stratstone's Mayfair showroom and subsequently sales of new models. It also demonstrates their belief in the importance of Jaguar's history to the brand. We look forward to a long and successful partnership with Stratstone." Individuals interested in purchasing or test driving this Commemorative E-Type will be received by appointment only and a specialist will come to the showroom to brief them with its rich history. The price of this car is available on application. Founded in 1993, Classic Motor Cars of Bridgnorth provides a Jaguar restoration service to the highest possible standard. It is recognised as one of the worlds leading, if not the leading restorer of classic Jaguars and is responsible for restoring some of the most historic Jaguars ever built. and even bespoke car design and manufacture.